Right about this point in autumn, I begin to lament the lack of local green vegetables. I’m just a bit potatoed, turnipped, and squashed out. Luckily, winter bok choy is here to save the day. Hooray! Actually, bok choy used to be my least favorite Asian green. I always had a problem with the way bok choy’s leaves would go slimy soft before the stem was tender. Turns out all I needed was a simple fix. Now, I separate the leaves and tender light green ends of the bok choy from the tougher white stems. Then, I add the stems to the boiling water to blanch them for about a minute. Just before I drain the pot, I add the leaves and light colored stems and give them a swirl in the pan just to wilt. This preparation can be used with any Asian green (or with Western ones such as broccolini if you prefer). It’s based on a recipe of the great Chinese-Australian chef Kylie Kwong. I had the great pleasure to meet her and test her recipes when I worked at delicious magazine in Australia. She’s an inspiration to all women chefs out there. If you ever have the opportunity to visit Sydney, I highly recommend a trip to her restaurant Billy Kwong. You haven’t had Hong Kong Chinese food until you’ve been there (well, unless you live in Hong Kong that is). You can use any Asian-style sauce in the mix here. I’ve chosen to use oyster sauce, soy, and sambal (which is actually a Southeast Asian chile paste). The secret to the recipe is in the heating of the peanut oil. To create a luscious saucy coating on the greens, you heat a 1/4 cup of peanut oil (or another oil of your choosing) to the smoking point. Once it begins to spit, pull it from the heat and pour it over the sauce covered vegetables. The sauce will let down into a broth that I invariably find myself drinking to the very last drop. In a small bowl, combine the oyster sauce, soy sauce, sambal, and sesame oil. Stir to combine. In a large pot of boiling, salted water, add the bok choy stems. Cook for 1 minute, until crisp-tender. Add the leaves and cook for a further 10 seconds. Drain. Place the greens in a large bowl and stir through the sauce to coat the greens. In a small saucepan, heat the peanut oil over high heat. After about 1 minute, when it is smoking and beginning to spit, remove it from the heat and carefully pour it over the greens (it will spit up a bit so be careful not to burn your arm). Toss the greens again, sprinkle with sesame seeds and serve immediately over rice. * Note: Sambal oelek can be found in many grocery stores and in Asian markets. 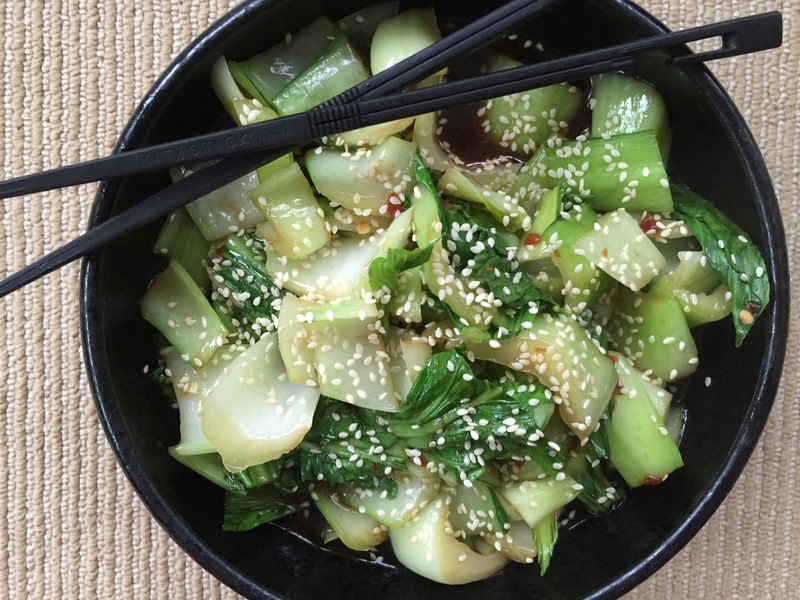 This entry was posted in side and tagged Asian greens, baby bok choy, bok choy, sambal, sesame, soy, winter greens. Bookmark the permalink.